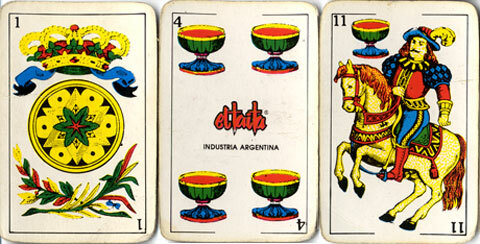 Argentina has produced a series of anonymous decks, both Spanish-suited and Anglo-American type and children's games. At the same time, a number of longer-established playing card manufacturers closed down or went out of business, thereby providing opportunities for smaller, more competitive businesses to enter the market. Many of these chose to remain anonymous. 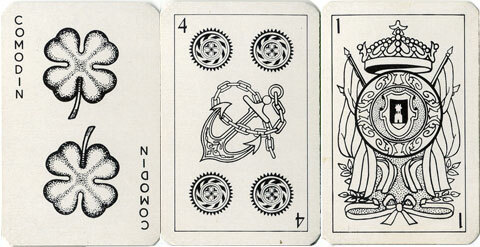 Some printing companies produce one-off editions of playing cards which are not easy to identify. Decks may carry the inscription "Industria Argentina" but no further details of their manufacturers are available. 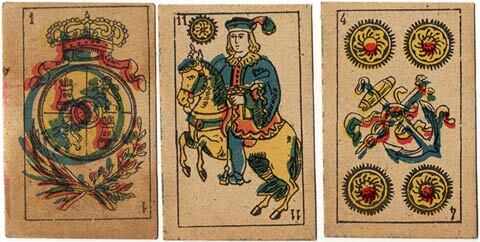 Right: cards from a 33-card children's game titled El Negrito Pedro, manufactured anonymously, c.1950s. (Click the images to see more). 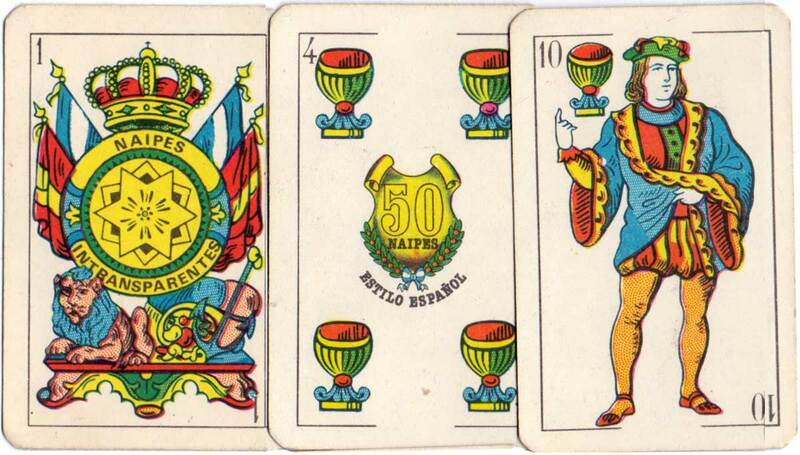 Right: cards from a children’s deck of miniature Spanish-suited playing cards, 40 cards, manufactured anonymously, possibly by Della Penna & Cía, c.1930s. (Click the image to see more). 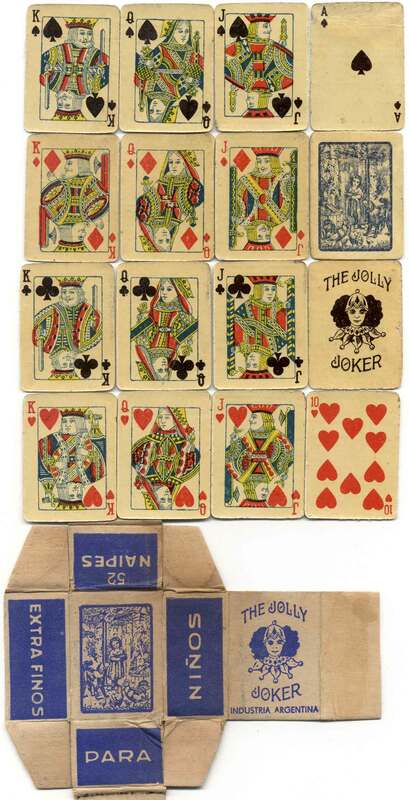 Right: cards from children’s deck of miniature "The Jolly Joker" playing cards, 52 cards + Joker + extra card, manufactured anonymously, c.1940s. 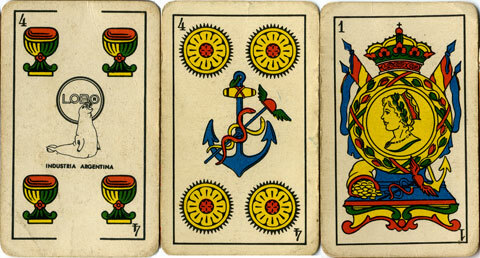 Right: cards from an original Spanish-suited pack titled 'Spanish Cards' published by Clark's Industries, c.1975. 48 cards + 2 Jokers. 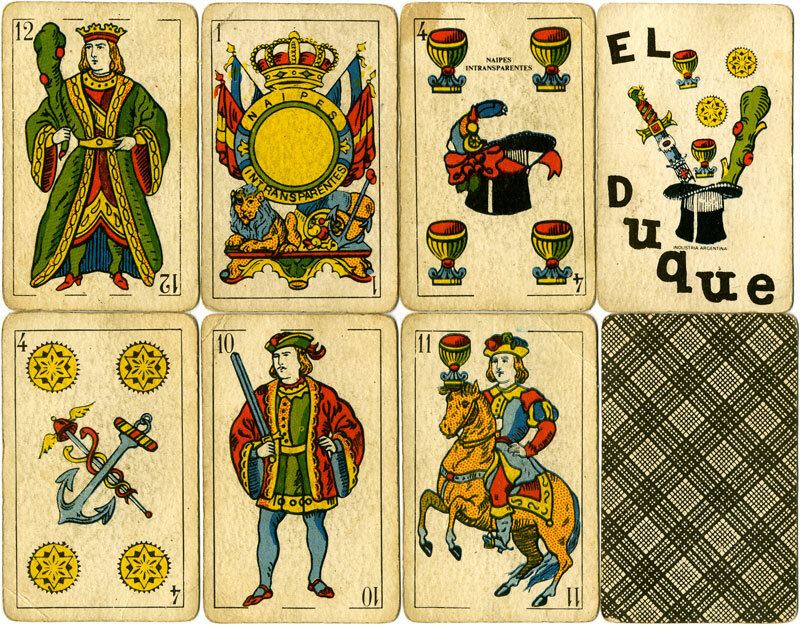 Right: cards from a standard Catalan-type deck titled “El Duque” by an anonymous manufacturer, c.1970s, based on the designs of Guarro (Barcelona). 48 cards + 2 Jokers. The Argentinean flag has been prominently added to the ace of coins. 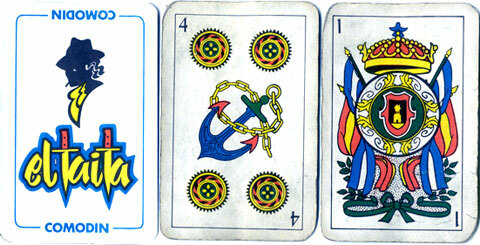 Right: cards from a standard Catalan-type deck, titled "El Mexicano", by an anonymous manufacturer, c.1980s, based on the designs of Guarro (Barcelona). 48 cards + 2 Jokers. The Argentinean flag has been prominently added to the ace of coins. 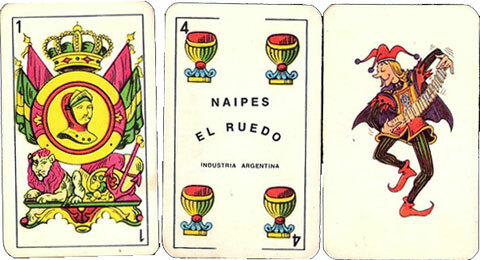 Right: cards from another anonymous Catalan-type deck, titled "El Ruedo", c.1980. 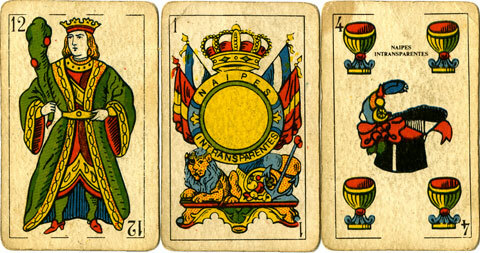 The designs are based on those of Guarro (Barcelona) but are more simplified than the above examples, and colours of the flags on the ace of coins are altered. 48 cards + 2 Jokers. 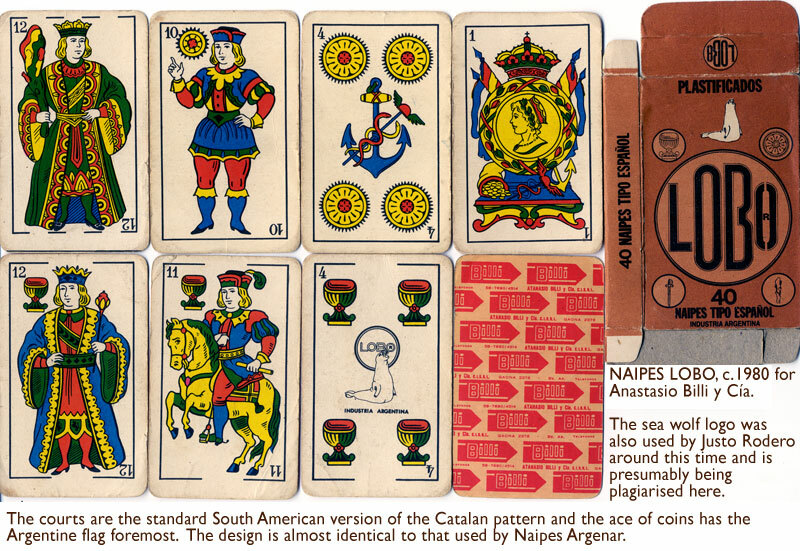 Right: cards from 40-card Naipes "Lobo" by anonymous manufacturer with advertising for Anastasio Billi on the reverse, 1980s. The designs are almost identical to those published by Argenar. 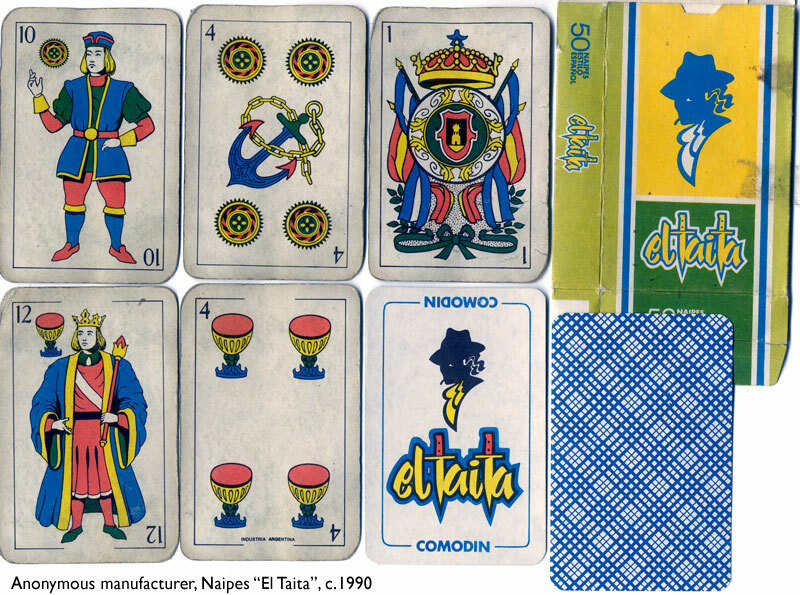 Right: cards from Naipes "El Taita", c.1990s, anonymous manufacturer (probably Naipes La Española / Gráfica 2001) based on the Spanish Cadiz pattern used by Vigor S.R.L. 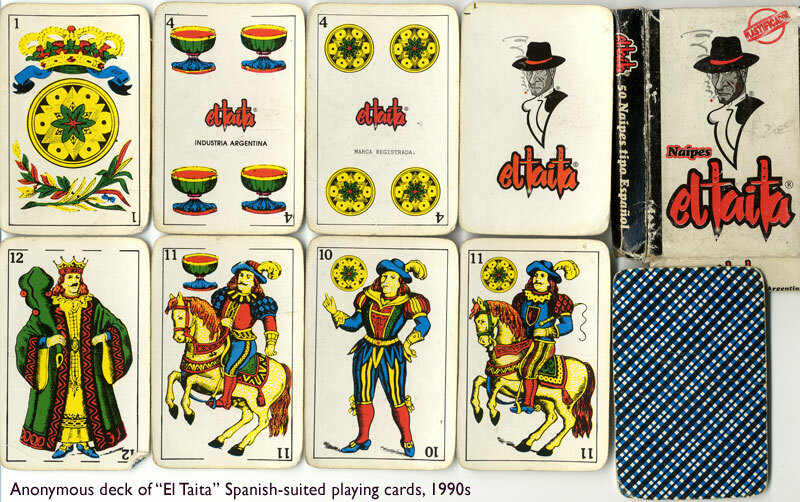 Right: cards from a different edition of Naipes "El Taita", c.1990s, anonymous manufacturer. 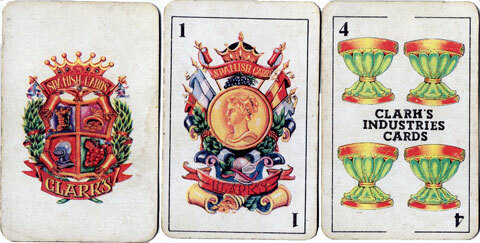 The ace of coins has Argentinean and Spanish flags draped down the sides of the central shield. 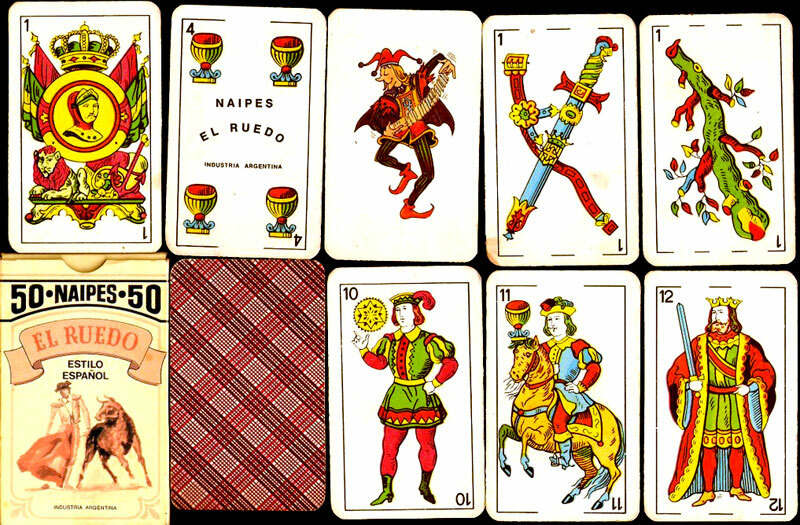 Right: cards from "Naipes Trebol", c.2000, anonymous manufacturer. 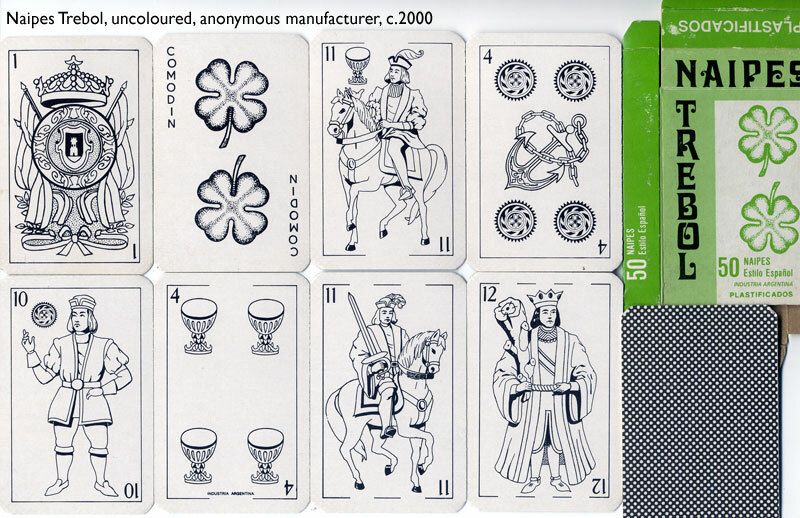 The deck is completely uncoloured and has the same outlines as the above example of Naipes "El Taita", although the box and jokers are different.